Welcome to my first ever Monthly Favorites post! Yeah! August flies so fast, Happy September everyone! Realizing that 2012 is coming to the end. :) August defiantly a memorable month! I celebrated my 6 years anniversary with my bf, its fasting Ramadan month! Then its Eid Mubarak! and the starting of my 5th Semester! My monthly favorite numbers are just for name guidance, no sort of numbering stage. 2 . Silkygirl Precision Sharp Eyeliner Pen in 01 Blackest Black (RM14.90) - It have been my all time most reach out product! Since my last favorite eyeliner, the pencil gel liner from Silkygirl too, this wins my heart the most! I have been recommending this product to all of my readers and friends. It is the best marker + liquid + pencil type of eyeliner. So pigmented and does not smudge. It does not dry up above eye shadow when applying it. You can get it at any local drugstore pharmacy that carries Silkygirl product. 3 . Silkygirl Precision Brow Liner in 02 Dark Brown ( RM14.90 ) - Again! A Silkygirl product! I am tottaly not been paid to all this love going on with Silkygirl product ok! Haha! Silkygirl product have been getting better and better! This is the Brow pencil. Its a retractable pencil. It is so easy to use, quite lasting and the pigmentation is easy to control. 4 . 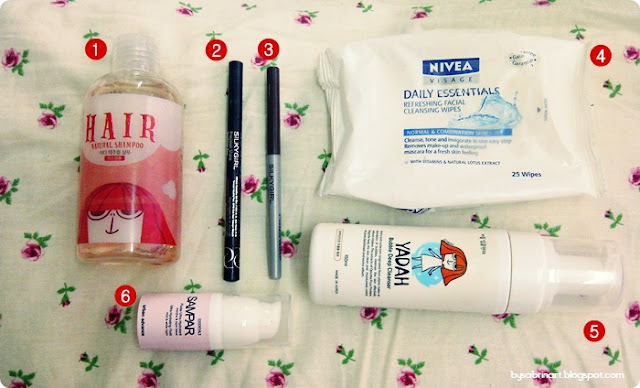 Nivea Refreshing Cleansing Wipes ( RM14.90 ) - I have reviewed this product. Wanna read the blog post, click here. I have tried to switch to a new cleansing wipes. But none of them satisfy me enough. This is my second purchase actually. I find my self loving it because, 1 wipe can clean my whole face including my makeup such as eye makeup and other stubborn makeups. I feel so fresh after using it. It s affordable too! You can get it at any local drugstore pharmacy that sells Nivea products. 5 . 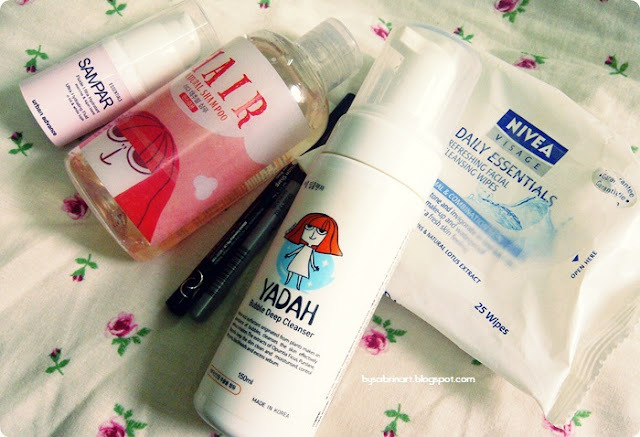 Yadah Deep Bubble Cleanser ( RM49.00 ) - I have also review this in a single post, check it out here. You guys can tottaly see that I am loving this product since the review of it. It is so easy to use! I pump actualy is enough for me to clean my whole face. Not to mention the scent! So good! Its fun and easy to use! Some price may vary. I can remember the accurate price. Sorry for that, correct me if I'm wrong. Well see ya next time! Dont forget to check out Yadah incoming giveaway at their Facebook page! You could win above items! CLICK HERE to Yadah Malaysia Facebook page. Do you have a monthly favorite? What are they? Till them with lots of love! *Don't forget to check other post and click on my ads! salam ziarah.. ^_^. anda boleh buat tempahan MyQalam Quran Read Pen berkualiti tinggi dan banyak lagi barangan muslim di Muslim Bazaar.